I am finding myself wanting more fish dishes these days; so, I have decided to share with you this delicious dish. Feel free to use any type of fish you desire. Position a rack in the middle of the oven. Preheat oven to 375Â°F. 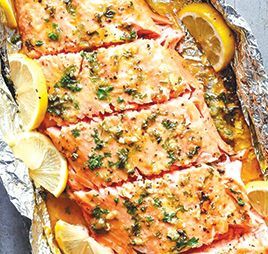 Line a baking tray/sheet with a large piece of foil, big enough to fold over and seal to create a packet (or two long pieces of foil overlapping each other lengthways to create your salmon packet, depending on the width of your fillet). In a small saucepan, melt the butter over low-medium heat. Add the honey, garlic and lemon, and whisk until the honey has melted through the butter and the mixture is well combined. Place the salmon onto lined baking tray/sheet. Pour the butter/honey mixture over the salmon, and using a pastry brush or spoon, spread evenly over the salmon. Sprinkle with as much salt as you desire and cracked pepper. Fold the sides of the foil over the salmon to cover and completely seal the packet closed so the butter does not leak. Bake until cooked through (about 15-18 minutes, depending on the thickness of your fish). Open the foil, being careful of any escaping steam, and let remain in the oven for 2-3 minutes to caramelize the top. Garnish with parsley and serve immediately with lemon slices.